It was worth the wait. Avengers: Infinity War is a blast. To say too much about Avengers: Infinity War would be to spoil it. After all, this is quite probably the most anticipated movie of all time. 10 years in the making, it’s the culmination of 18 films worth of separate narratives and brings together an enormous number of characters from all corners of the Marvel Cinematic Universe. With the immeasurable hype, there also comes a sense of expectation – and hope, a desperate hope that it will not disappoint. With the Russo brothers in control, previous directors of Captain America: The Winter Soldier and Captain America: Civil War, we should never have been in doubt. 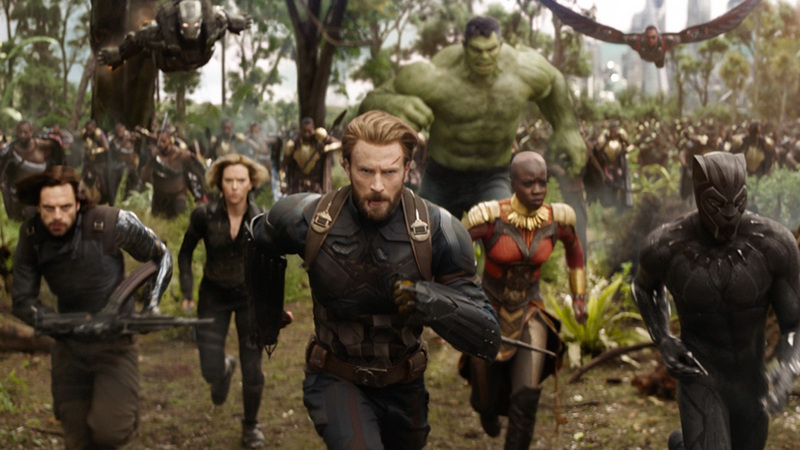 Quite simply put, there has never been a film as epic in scope as Avengers: Infinity War. It’s often understated how much these films mean to people. To many, this is a new generation’s Star Wars. Marvel Studios has earned such a reputation, and Infinity War cements it. This is their most ambitious story so far, rightly so considering the lofty nature of the source material, with a truly intergalactic scale of events. We jump from new planet to new planet, the cosmic fully embraced. Earth is still involved, of course, but that can be temporarily forgotten with the sheer frequency of shifts from one landscape to another. Some may see this as a fault, the brevity of certain scenes meaning we cannot invest in the actions taking place. Though this is true in a few cases, the immense galaxy-exploring provides the grandiose quality that Marvel’s biggest bad sorely demands. Thanos is everything to Infinity War. In order for the drama to work, he must be convincing. Fortunately, he steals the film as though itself were an Infinity Stone. In one fell swoop, he has rocketed straight to the top of the list of Marvel’s villains. This is in part due to astonishing visual effects work, not only in regards to Thanos but the movie as a whole. Though he resembles the potential offspring of Bruce Willis and a purple grape, the extraordinary detail of the VFX means that we deeply believe in Thanos as a character. The writing of the Mad Titan’s portion of the story, which is of sizeable focus, is stellar. His motivations are laid out in a defined and coherent way, with goals that have a surprising resonance in a real-world context. The terror he inflicts on our heroes – be assured, it is brutal – means that we cannot go as far as sympathising with him but, crucially, we can understand why he is doing what he believes he must. Assembling such a significant quantity of beloved characters means improbable possibilities for fun interactions, which is an opportunity the Russos don’t miss out on. There are so many great team-ups, whether momentous or brief, with a particular trio of female heroes coming together in battle being just one highlight. Some characters fall by the wayside, even those you might expect to be centre stage, though it becomes clear why this is the case as Infinity War draws to a close. Remember, there is another one of these due next year – the continuation of this story that was originally titled Part 2. However, Infinity War does not fall into the trap of Deathly Hallows or Mockingjay whereby the latter half of the plot contains all the action. There is enough excitement in this instalment alone to keep us satisfied several lifetimes over. It’s also really funny, almost effortlessly so. Marvel Studios has never played it entirely straight-faced, though this may be their most seamless blend of levity and pathos yet. With the likes of Star-Lord, Thor and Spider-Man around, this was never going to be unbearably bleak. But it does succeed in doing what critics have long chastised the Marvel Cinematic Universe for: high stakes are established almost immediately, the breathtaking third act raising them to levels of staggering consequence. As the screen turns to black, we are left in a position where anything could happen next. With elements of Greek tragedy, Avengers: Infinity War is everything audiences wanted and then some. Thanos has arrived in style. Avengers: Infinity War (2018), directed by Joe and Anthony Russo, is distributed in the UK by Walt Disney Studios Motion Pictures, certificate 12A.